India Microprocessor Market shipments volume reached 0.89 Million units in CY Q4 2013. Intel dominates the PC market. India Microprocessor market shipments volume reached 0.89 Million units in CY Q4 2013. Intel dominates the PC market. Whereas, Samsung dominates the mobile Microprocessor market. 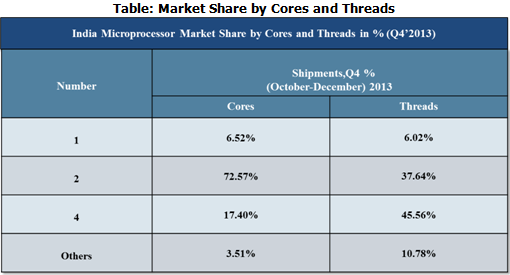 During CY Q4 2013, in the PC Microprocessor market, clock speed of 2.9 GHZ captured more than 32% of the total market share. Further, in the instruction set segment 64-bit registered around 98% market share. Source: 6Wresearch Quarterly India Microprocessor Market, CY Q4 2013. Note: Shipments does not include devices having embedded microprocessors. In the PC segment, top two player’s captured around 96% market share. Cache size of 3 MB registered 68% share. 5 GT/S DMI (Direct Media Interface) registered more than 84% of the total market share. Earlier, Microprocessor were mainly considered for PC and Laptops. But with the technological advancement, mobile phones and tablets are also equipped with these devices. The Indian PC and Laptops processor market is dominated by Intel. Although, in the mobile and tablet segment, Samsung and Qualcomm lead the market. Mobile Microprocessor market is more focused on features such as power efficiency and the user experience. Note: Others include 16, 12, 8, 6, cores and threads. Over a period of time, awareness of smartphones and tablets among the Indian consumers has increased significantly. This factor has resulted in an increase in demand for faster and more power efficient Microprocessors in India.